These two Louis XVth Commodes passed through my workshop recently. It was a special treat to discover that both were attributed to Louis N Malle. Cabinet maker. Or to use the correct French term, ébéniste to Louis XVth. Both commodes were almost identical being in the classic bombé shape that you can see from the photos and each heavily decorated with gilt ormolu. Both featured panels of lighter rosewood against a darker surround. 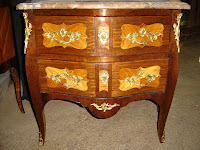 However, the timber species of surround veneer differed, Kingwood was used for the larger commode, while a species of Ebony, ébéne verte, was used on the smaller more delicate commode. Both of the commodes had marble tops, which is common for the period. One of these was clearly the original, while the other, I suspect was a 19th century replacement. Moving these marble tops aside one could clearly see the maker’s stamp and seal, leaving no doubt to the provenance. While the main structures were relatively sound, damage to the veneer from shrinkage of the supporting timber was pronounced. As was substantial wear to the drawer runners and drawer bottoms. Apart from these two major items conservation consisted of careful cleaning veneer replacement and finish repair, the results I hope speak for themselves.